It's probably safe to assume that most people have read at least one novel which has been made into a movie. In many cases, the story from the book is streamlined and certain parts of the story or some of the characters are excised from the final product. Because of this, a number of these films don't feel as if they came from a novel, due to the fact that the plot has been shorn of so much content. Conversely, there are some movies which are so dense and detailed that they feel as if they could have come from or should be a novel. There aren't many examples of this, but I can now easily identify what may be the ultimate one -- Avengers: Infinity War. Avengers: Infinity War begins some time after Captain America: Civil War and immediately following the events of Thor: Ragnarok. The spaceship carrying the refugees from Asgard has been invaded by Thanos (voiced by Josh Brolin), an alien who is searching from the six Infinity Stones. Bruce Banner (Mark Ruffalo) is sent to Earth, where he warns Iron Man (Robert Downey, Jr.) and Dr. Strange (Benedict Cumberbatch) that Thanos will be coming to Earth, just as some of his emissaries attack New York. Meanwhile, The Guardians of the Galaxy -- Peter Quill (Chris Pratt), Gamora (Zoe Saldana), Drax (Bautista), Rocket (voiced by Bradley Cooper), and Groot (voiced by Vin Diesel) -- encounter Thor and learn of Thanos' quest. As Thanos traverses the galaxy, the various heroes -- those from Earth and Space -- begin to team up in order to do what they can to save the universe. One can call Avengers: Infinity War many things, and one would be a promise fulfilled. For years, comic fans have been waiting for the kind of movie which would deliver the kind of multi-character action which Marvel has been doing in their comics for years. Captain America: Civil War put forth this idea, and this new movie takes it to the extreme, bringing together the bulk of the characters which we've come to know through the movies, placing them in an undeniably epic story. The result is a sprawling film which plays more like a novel than most movies which are based on actual books. (Yes, I realize that this is culled from a comic-book mini-series, but humor me.) Each "chapter" takes us to a different place and focuses on a specific group of characters. Granted, it was somewhat of a mistake to separate the heroes, but it was certainly interesting to see the pairings which came of his, such as Thor & Rocket and Iron Man and Quill. It can easily be argued that Avengers: Infinity War bit off more than it can chew, but The Russo Brothers must be applauded for taking on such a daunting task. Also, it was quite daring to have a summer tentpole movie which ends on such a down note. And the movie certainly ebbs and flows, there is a very nice balance of action and humor here, with the emphasis being placed on the latter at times. As this movie is essentially a wholesale blending of all of the movies in the series, it's obvious that it has absorbed some of the comedy seen in Thor: Ragnarok and Guardians of the Galaxy. The jokes can't take the sting out of the finale, but you will remember the many funny lines here. Avengers: Infinity War isn't perfect, but it's a great example of how popular entertainment and skillful storytelling can exist in the same space. It could have been a little shorter and it didn't need to spotlight ever character, but it's certainly not a forgettable super-hero movie and it will get you excited for "Chapter 2". Avengers: Infinity War contains a bit too much Paltrow on 4K UHD courtesy of Walt Disney Studios Home Entertainment. The film has been letterboxed at 2.35:1 and the Disc contains an HEVC 2160 transfer which runs at an average of 85 Mbps. (That's one of the highest average bitrates that I've seen for a 4K.) The image is extremely sharp and clear, showing no noticeable grain and no defects from the source materials. The colors look fantastic, most notably reds and greens, and despite the fact that there are some dark scenes, the image is never overly dark or bright. The depth works very well, even in this 2D version, and the level of detail is notable. The one issue I had was that the overall clarity of the image does make Thanos look a bit plastic at times. The Disc carries a Dolby Atmos audio track which runs at 48 kHz and an average of 5.0 Mbps. The track provides clear dialogue and sound effects. This track is a constant feast of surround, subwoofer, and stereo effects. The surround effects are nicely detailed and are paired well with the front channel effects, and the sound moves cleanly from front to back. The stereo effects enhance sounds coming from off-screen. These effects really help to place the viewer in the center of the action. 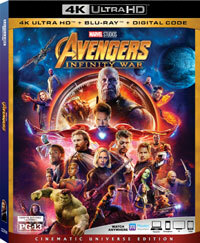 The extra features for Avengers: Infinity War are found on the separate Blu-ray Disc. We begin with an AUDIO COMMENTARY from Directors Joe and Anthony Russo and Writers Christopher Markus and Stephen McFeely. "Strange Alchemy" (5 minutes) looks at how the film takes characters with different styles and personalities and puts them together in the story. "The Mad Titan" (7 minutes) looks at how the Thanos character has impacted the various films in the series and allows us to see Brolin on the soundstage doing his motion-capture acting. "Beyond the Battle: Titan" (10 minutes) takes us on-set to explore the scope of making a movie this big, as the Russo Brothers talk about the planning which goes into the movie. "Beyond the Battle: Wakanda" (11 minutes) shows how a ranch in Georgia was transformed into an African country. The Disc contains four DELETED SCENES which run about 10 minutes. They cut out John Favreau?! What?! There's also a nice scene showing how the Guardians got to Titan. Finally, we have a 2-minute GAG REEL.